When you decide to remodel your kitchen it’s important to have a plan, to know where to begin. From deciding what is needed to the final product, there is lots to be done and without a plan, you may miss the details you really want. 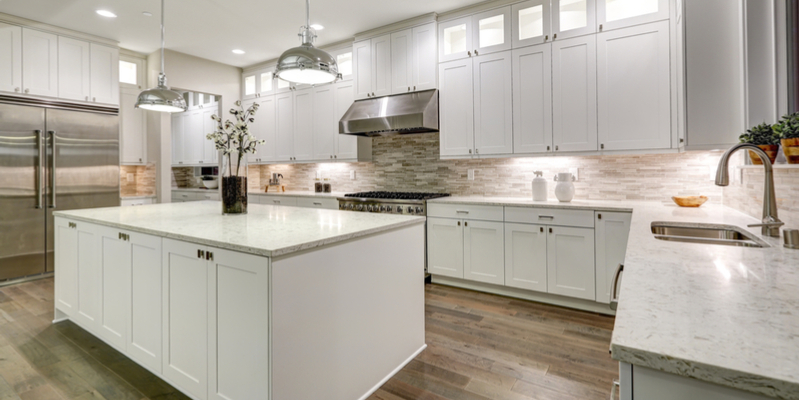 Some homeowners begin with appliances, others with an idea book, and yet others with an expansion plan, but wherever you begin, here are some steps to help you see your kitchen remodeling project through to successful completion. An excellent starting point is the determination of what you need in the kitchen. Finding a layout that works and features which fit your cooking style are a good foundation on which to develop your project. Consider the number of people who share the kitchen – one, two, or more. Is your current kitchen’s footprint sufficient or do you need an expansion plan? Gather photos and images of kitchens you love as you plan and return to them before the project begins to edit them down to exactly what your kitchen needs. To start you’ll want to develop your plan according to a “scope of work” which simply describes your kitchen remodel’s parameters – addition, plumbing, electrical, flooring, cabinets, etc. Next, you will need a preliminary budget. These two may change over the course of your project, as they go hand in hand to completion. Once you have the preliminaries in place, you’ll want to find the remodeling and service professionals you will need to get the job done. Throughout the project, you may need a designer, cabinet maker, plumber, electrician, general contractor, a builder, and more. Do your research, ask for recommendations, and read reviews to find the ideal home professionals for your project. Now comes the fun, with actual drawings, floor plans, and more. Try to refrain from imagining the final kitchen, and focus on layouts and space here. Next you’ll decide on materials, total square feet, and construction costs. As your kitchen project moves forward, you’ll get into the all the details, determining your kitchen style, choosing fixtures and finishes, colors, and more. In this phase, here are some of the decision which will await you: cabinetry (material, style, finish, color); countertops; flooring; backsplash; refrigerators, stoves, and other appliances; kitchen sinks and faucets; as well as hardware and light fixtures. Once the decision making phase is complete, you will finalize the kitchen design, get the construction drawings, and apply for your final permits. With these, you will also receive your contractor’s final pricing and make any needed adjustments to your design to keep your project on budget. During the wait for permits, larger items can be ordered. The first phase of the actual remodel is ‘demo’ – the demolition of the old kitchen, which coincides with the set up a temporary kitchen. Once ‘demo’ is complete, the remodeling begins toward completion. As your kitchen remodel comes to a close, and construction is nearly over, you will be asked to complete a ‘punch list’. The ‘punch list’ is simply a list of items in your remodel which were missed, forgotten, or done incorrectly (scratches in new appliances, faulty fixtures, paint touch-ups, etc.). The contractor will attend to all the details, completing your kitchen remodel. Now all that is left is for you to move into your remodeled kitchen and enjoy!